I live in a relatively new subdivision. One of the downsides to this, so I thought, was the relative lack of mature trees, both as street trees and in people's yards. I like neighborhoods full of graceful, mature shade trees. However, there are a couple of upsides to this. For one, much of my front yard is in full sun, the better to grow the types of annuals, perennials and bulbs I enjoy most. I'll get to the other upside in a moment. Swath of Crocuses in my garden from last March. There is a reason why I'm reposting this unseasonal picture, which will become clear later. Since we no longer have dogs, we've been able to seal off our doggie door to the outside. This means that our cats, which we intended to be indoor pets in the first place, cannot let themselves outdoors at will. The major upsides to that are that we don't have to worry about our cats being endangered by traffic, or having encounters with dangerous animals. (We have raccoon and foxes around, and a coyote was spotted once, several years ago.) The second major upside is that we don't have to worry about the cats having encounters with animals to which they are dangerous. Over the years, Luke and Peppermint have brought in numerous birds, mice, chipmunks and baby rabbits, some alive, some dead. The dead ones were distressing enough, but capturing and freeing the living creatures was always a frustrating task. The downside to the loss of the doggie door, is, of course, that it came about due to the deaths of Jenny and Laces, who we miss very much. But there is also a downside to not letting the cats out, which will follow. 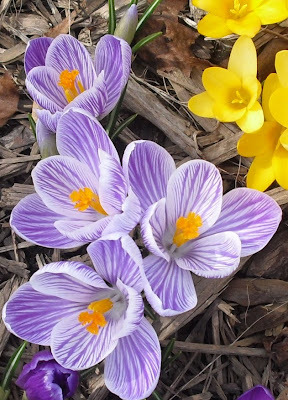 Closer view of some of my favorite Crocuses. Holes where at least one squirrel has dug up and consumed a number of crocus bulbs. In the second picture, with the two holes, you can see the debris from the consumed bulbs. These shots are from the same place as the drift of crocuses in the first picture I posted. I'll have to do some replanting if I want to have a nice display of flowers to herald the arrival of spring. Since I don't want to resort to inhumane methods, I've been spreading blood meal (a readily available fertilizer) in the beds where the crocuses are planted. This, supposedly, will discourage squirrels from digging in those areas. I also lost my patience the other day, and threw a couple of rocks in the general direction of a squirrel who was hanging out in my maple tree. I wasn't aiming to hit him; I was trying to scare him away, which it did, at least for a while. It upsets me that I feel this way; I used to like squirrels, honest. I posted a picture of this cactus shortly after I purchased it, last May. Since it has been outdoors this summer, it has bloomed three times, the third of which was the other day. 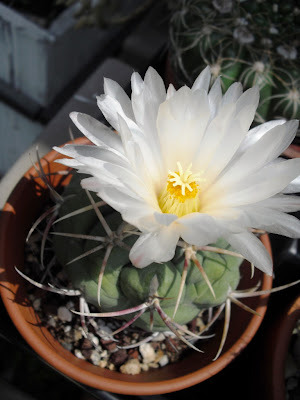 Love that flowering cactus. And wow never heard of squirrels digging up bulbs. I did have a dog that did that once though!